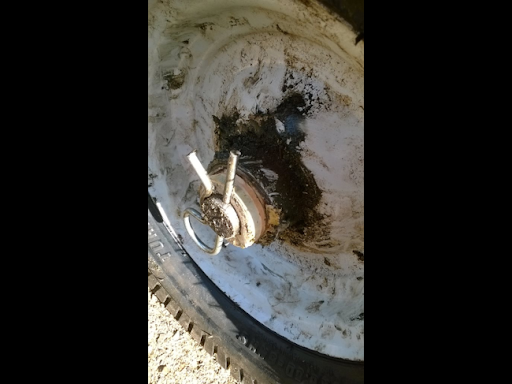 As you may recall, the trailer tire had a tough winter. It was flat, and split, and as it turns out, the bearings were completely shot in it. I managed to remove the tire, and with Grandpa's help, we eventually got the remains of the bearing off. It took nearly two weeks for a replacement tire to be found and mounted on my rim, but this past week I was able to pick it up and begin the process of reinstalling it. Grandpa suggested a fix that he has been using for many years - replacing bearings with wooden ones made of tree limbs. He brought over a suitable diameter of birch, which I peeled and drilled a 1" diameter hole through. This fit nice and snug. But of course, there was another issue - I could no longer find the washer that held the wheel on the axle! Once again, wood to the rescue. A slightly larger disc of birch was pressed into service and so far is holding... We'll see how long it lasts under real use though. In the meantime, I was able to flip the trailer back onto its feet, and roll it to the top of my ramp down to the sawmill. Soon I will load it up with slabs and get them under better cover. As Donna and Kenny have been putting in the first baby-steps garden here at the homestead, I have spent a bit of time down there giving (often unsolicited) advice and just keeping an eye on the pond levels. While observing the developing traffic pattern down there, I noted that Grandpa had recently leveled off a large circular area just off the path where last fall we had burned a large amount of brush we had cleared around the cabin. 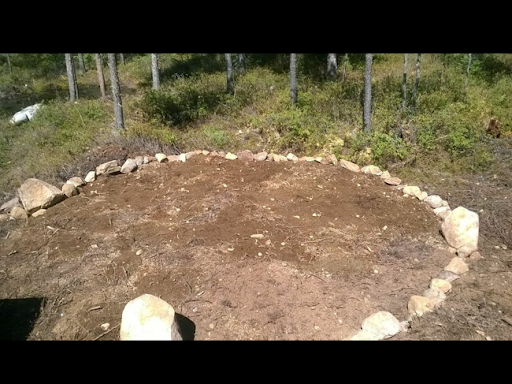 I started to formulate a plan of perhaps someday turning that pre-burned area into a nicely cleared circle for a fire pit. It was centrally located, sporting afternoon and evening shade, somewhat level, and very close to the pond for easy access to water. I mentioned it as a passing thought only a few days ago to Grandpa, and lo and behold, yesterday he was game to get it done. First though, he had to establish that his garden tractor could traverse the ravine. He proved this easily first thing, with me following on my ATV, just in case we did need to use the winch. With that completed, he then proceeded to shame me by hauling a load of gravel along the same ravine path, filling in low spots, all in the time it took me to simply rake out the leaves and clippings he had brought from his place as job number one of the day. Then he hauled another load of gravel to where I had laid out the fire ring. 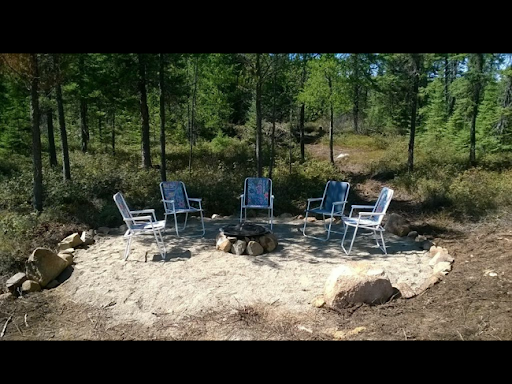 I made it in a large enough circle that the fire bowl would fit nicely, as well as lawn chairs that could be moved forward or backward to accomodate everyone's preferences. I tried to keep up with his shovelling on the next two loads, and eventually we got the main area mostly covered in a mix of clay and soil. 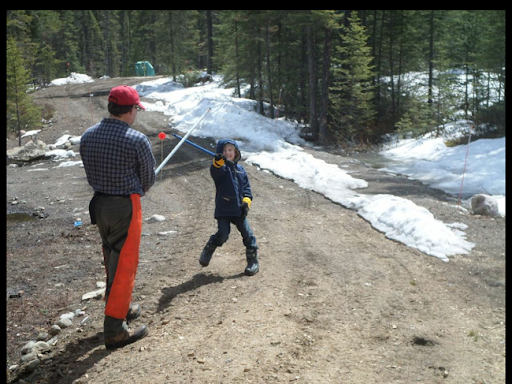 Grandpa then agreed to come with me down the road to a local pit to commandeer some more uniform gravel. We loaded that up in a flash and returned to the circle before taking a break for lunch. 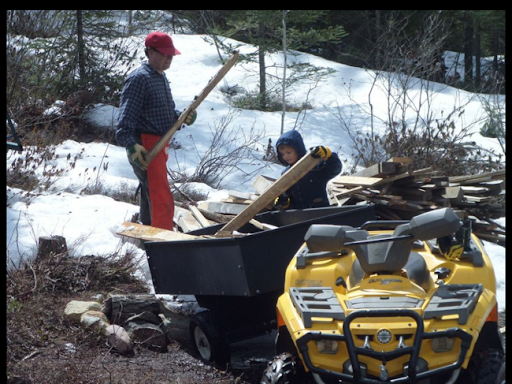 After lunch, Grandpa returned and we used the wheelbarrow to empty the truck and rake out a smoother surface. I found last year's fire bowl under the yurts, and set it up on some bricks in the centre of the circle. I didn't like the look of that, and it was really challenging to level. Instead, I put the bowl directly on the gravel, leveled it as best I could, and then jumbled the bricks under it. This still looked roughshod, so I found some larger, flatter rocks and piled them under the bowl. When Mummu agreed that this looked good I knew I had a winning solution :). Now, we just need someone to come and share our fire and fellowship! It has been a slow start to spring here for sure this year. My big project for the summer will certainly be getting the porches in a useable condition on both the sauna and the cabin. These are predicated on me being able to dig down at least a short distance into the "soil" to put some sort of footings for the porch posts. Right now it is easy to see that the ground is still quite frozen only a short distance down, as there is no shortage of standing water all over our property from the snowmelt. Yesterday marked the first time that I could really begin to see some of my piles of scrap lumber appearing from under the rapidly melting snow. With everything else looking muddy and wet, these piles especially stood out as looking untidy and keeping the whole homestead looking like a giant construction site. 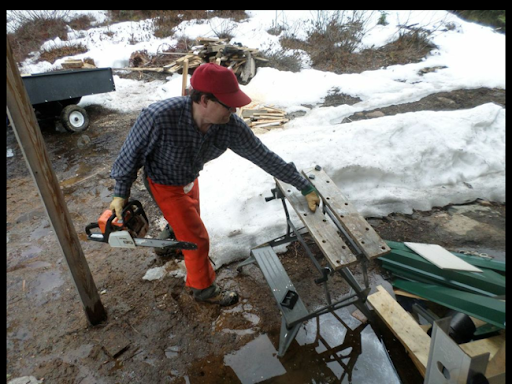 At first I set up some metal sawhorses at the front of the homestead, where the dojo tent resides, and began cutting some of the slabs from my slab pile there. 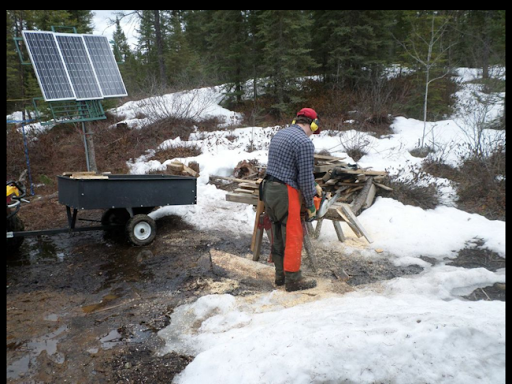 Previously my father had been a huge help in processing these slabs and then moving them up to the cabin to burn. I planned on cutting up many more, and by myself, so I opted to move them more efficiently than just having my father carrying bins of wood down the driveway. 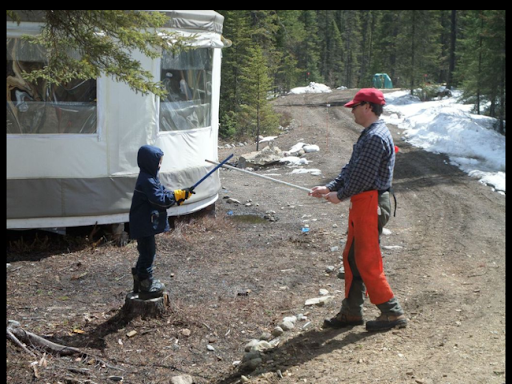 Fortunately my trailer had melted out of the snowbank enough to be able to be hooked up. There were two caveats - first, the tongue of the wagon was just a piece of square stock, with no hitch, and, worryingly, Grandpa and I had pounded it slightly flat when we first got it to get it to fit into the tractor's simple pin hitch. The ATV had a small ball hitch. 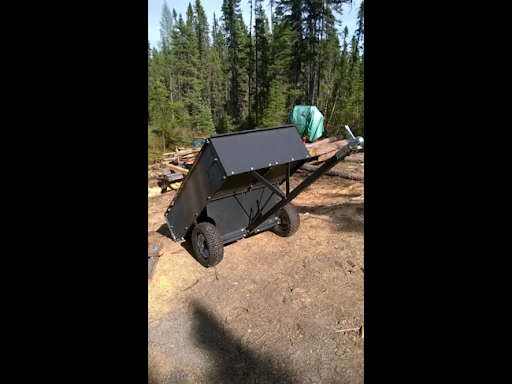 I purchased an inexpensive hitch for the trailer, but then Grandpa and I had to work at pounding the tongue back to a reasonably square shape. With a bit of wailing using Grandpa's heaviest maul, we managed to get the new hitch installed. Then the second problem - the trailer had a profoundly flat tire. I managed to pump up this tire, but then noted that it was badly split down one side. Sigh, I hooked up the hitch (which was very, very tight the first time, but has loosened up with repeated use) and set off anyway. As a test run before collecting my first batch of slabs Grandpa and I cut down a very, very dead jack pine between our properties and then I loaded it up and brought it to my splitting stump. 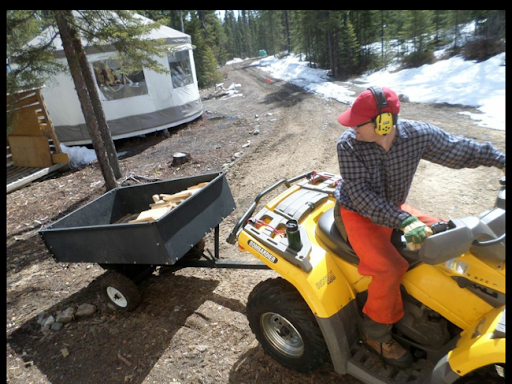 This worked like a charm, although backing up with the trailer on the back of the ATV was a bit of a challenge. Next I did a load of slabs, and by this time the tire was pretty much fully deflated. In the thin, soft layer of soil I opted to keep going. As I unloaded the slabs, I noticed a pile of wood coming out of the snow just beside the sauna. I decided that it should be my priority, as it was cluttering our actual living area. So I emptied the cut up slabs into my main woodshed, and then backed through the water to the new pile. 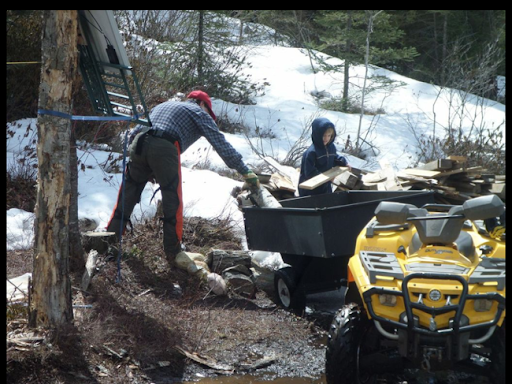 With Kenny helping, we began to cut up and load wood from there. I tried to note if there were nails or screws, and set them aside for more careful processing. Of course, after only a short time Kenny and I came to blows and only a bokken / light sabre duel could solve our differences. I ended up taking several blows to my backside and had to surrender. With him heading inside to celebrate with a victory candy, I continued well into the afternoon as Donna fired up the muchly appreciated sauna and did some laundry. 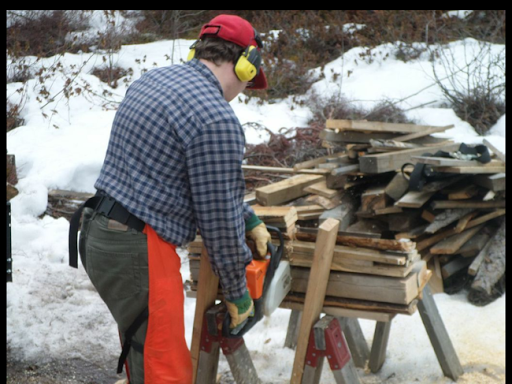 It was nice that she was handy with the camera to capture my horror as, after cutting up a bundle of slabs, I set the chainsaw down on a small workbench, only to hear it slide off and tumble into a deep puddle. Crying out in despair and rushing back to the hissing, steaming, dripping saw, I made a priority of putting the bench on firmer, more level, and dry ground. It was gratifying to be able to pile up enough slabs to cover an entire wall of the woodshed. And this was without tackling the main slab pile - something that may have to wait until the weekend, as I've been asked to work for the remainder of the week.